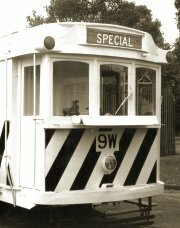 All items and information on this website, unless otherwise noted, belong to the Melbourne Tram Museum (incorporation number A0048167Z; ABN 11 293 508 607) and are subject to copyright. This publication may not, in whole or in part, be lent, copied, photocopied, reproduced, translated or reduced to any electronic medium or machine readable form without the express written permission of the copyright holder. Links to other sites are for information only and do not imply any endorsement of those sites or their content by the Melbourne Tram Museum. The views and opinions in expressed in articles on this website are individual to the author(s) and are not endorsed as the official views or opinions of the Melbourne Tram Museum. This website has been tested with Internet Explorer 11, Microsoft Edge 38 and Chrome 57. Some website features may not be supported if you use a browser other than those listed.